Ambrogio Spinola, (known as ‘Ambrosio’ in Spanish speaking countries), was one of the greatest military commanders of his generation. A highly successful Genoese general, he was active on behalf of the Spanish crown. Due to his exploits on behalf of Spain, he was the fiercest opponent of Maurice of Nassau, Prince of Orange (1567 – 1625). Ambrogio was elevated in the Spanish peerage as Marquis of Los Balbases in 1611. By descent within a branch of the Doria family, Genoa, until 2018. P. Boccardo, J.L. Colomer, C. Di Fabio (eds. ), “Ambrosio Spinola. Fortuna iconográfica de un genovés al servicio de la Monarquía” from España y Génova. Obras, artistas y coleccionistas, Madrid 2004, illus., p. 196. We are grateful to Dr. Rudi Ekkart for confirming the attribution of this imposing portrait to Michiel Jansz. van Mierevelt in full. Spinola first visited Holland early in 1608 for peace negotiations in The Hague, resulting in the Twelve Years’ Truce with the Netherlands. 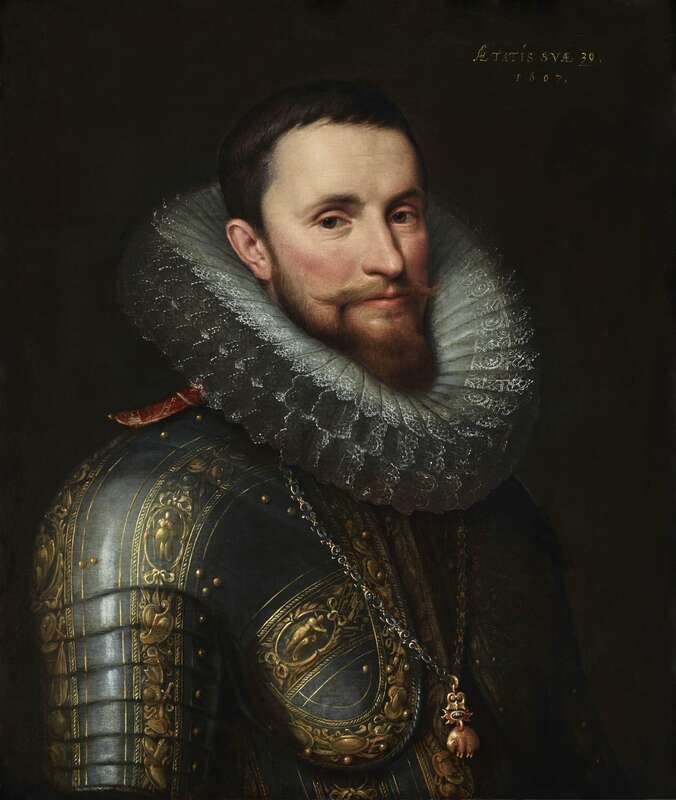 As such, all known versions of his portrait by Mierevelt date to 1608, 1609 or later, most notably the three-quarter-length in the Rijksmuseum which is likely to be the prime original. In our portrait, the year ‘1607’ presents a conundrum. Not only is it a year before Spinola sat to Mierevelt, but neither was he thirty-nine until 1608. We must therefore assume, on the basis that the inscription is original, that the last digit at some stage became worn and was erroneously and incorrectly changed at a later date. Spinola is shown proudly wearing the badge of the Order of the Golden Fleece that he had been awarded in 1605 by Philip III of Spain (1578 – 1621) for the siege and capture of Ostend the preceding year. He is placed at a slight angle, a format ultimately deriving from the 16th century masters Titian (c. 1485 – 1576) and Antonio Moro (c. 1516 – 1575), very much the standard composition for military figures by this time. His richly elaborate armour, etched and fire-gilded with decorative ribands and pictorial cartouches including Minerva, goddess of War, would have been the very finest quality, and Milanese-made; Milan was the leading centre for the production of armour in late Medieval and Renaissance Europe, and this particular armour is a superior example showing an individuality of design that contrasts with more mass-produced examples with standard classical designs. Over this, he wears a fashionable ‘molensteenkraag’ or mill-stone ruff, of very fine lace. The painting is thought to have always been in Genoa. This is of particular interest in relation to Spinola’s Genoese heritage – indeed it is not inconceivable that this painting may have descended in his family. Spinola came from an aristocratic and powerful family of bankers in Genoa, an Italian republic and protected state of the Spanish Empire at the time, due to the Genoese banks having control of the Spanish monarchy’s finances. He was the eldest son of Filippo Spinola, Marquis of Sesto and Benafro, and his wife Polissena, daughter of the Prince of Salerno. In 1592 he married Giovanna Baciadonna, daughter of the Count of Galeratta. In 1602, along with his brother Federico, he placed himself and an army of 6,000 men at the disposal of the Spanish in their battle with the Dutch Rebels. By 1606 he had been appointed Commander-in-Chief of all the Spanish forces in the southern Netherlands. In spite of receiving the grandeeship, Spinola was financially ruined by 1611. Following the siege of Ostend, he had been forced to pledge the whole of his fortune as security for the expenses of the war before the Genoese bankers would advance funds to the Spanish government, but was never repaid. Nonetheless, he would go on to earn further acclaim as a master of siege warfare, renowned for the capture of Breda after a prolonged siege (28 August 1624 – 5 June 1625). This followed the renewal of the war with Holland in 1621, twelve years after the signing of the peace treaty in The Hague. The surrender of Breda, the peak of Spinola’s career as a military commander, is famously depicted in the great picture by Diego Velázquez (1599 – 1660), known as Las Lanzas, painted ten years after the event. The illustrious commander was also portrayed following the capture of Breda by Sir Peter Paul Rubens (1577 – 1640), in a portrait dating from 1625 – 1628, in which he is represented in the same format as the Mierevelt type, although facing the other way. title of ‘Marquis de los Balbases’, still borne by Spinola’s descendants, was all the compensation that the family received for the vast fortune they parted with in the service of Philip III and IV. Lamport Hall, Northampton, bust-length, dated 1608, oil on panel, 16 ½ x 15 ¾ in. (50 x 40 cm. ); Rijksmuseum, Amsterdam, three-quarter-length, dated 1609, oil on canvas: 46 ¾ x 35 ½ in. (46.8 x 87.5 cm. ); Rijksmuseum, Amsterdam, bust-length, dated c. 1609 – 1633, oil on panel: 11 ½ x 9 ½ in. (29.5 x 24 cm. ), [part of a series (not all by Miereveldt) formerly known as the Hondselaarsdijk series, nowadays called the Leeuwarden series because of the origin; see: J. Bikker, 'Series of soldiers unraveled', Bulletin of the Rijksmuseum 54 (2006), p. 412-427.]. We are grateful to Dr. Tobias Capwell, of the Wallace Collection, London, for his thoughts on the armour in this portrait. Jonathan Bikker in J. Bikker et al, Dutch Paintings of the Seventeenth Century in the Rijksmuseum Amsterdam, Volume 1, ‘Artists born between 1570 and 1600’, Rijksmuseum 2007, p. 260. Spinola’s capture of several fortified towns in his career were also commemorated in the birds’ eye view maps of Crispijn van der Passe’s (c. 1564 – 1637) engraving entitled Conquests of Ambrogio Spinola (see Conquests of Ambrosio Spinola, including: Ostend, Oldenzaal, Lingen, Wachtendonk, Krakow, Lochem, Groenlo, Rheinberg. Engraving. Rotterdam, Museum Boijmans Van Beuningen (inv.no. BdH 15230 (PK)).